I love full circle moments. A recent visit to Connecticut gave me the opportunity to visit my son at his new college and see my college roommate for the first time in years. It also gave me the opportunity to drive from end to end of this small state. 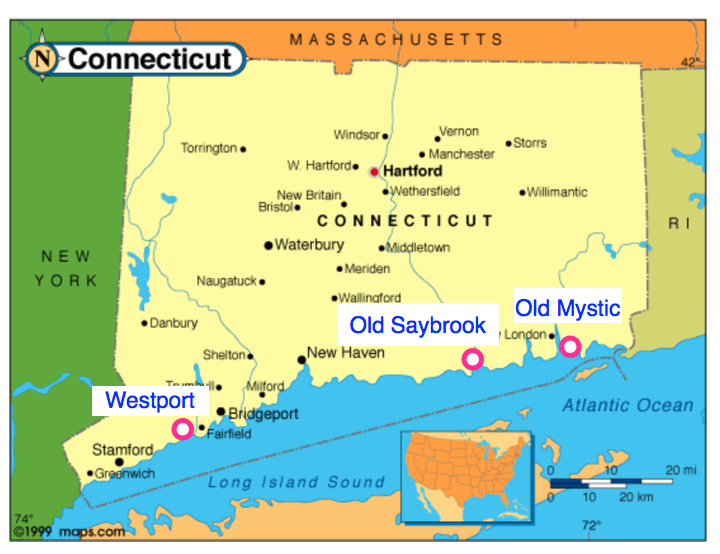 It’s not like I haven’t made this trip before, I grew up in New York State and drove to college in Rhode Island but it’s been a while and this time I stopped to enjoy the journey with visits to 3 lovely yarn shops in Old Mystic, Old Saybrook and Westport. As you can see they are all in seaport towns and conveniently located just off I95. The timing couldn’t have been better as the fall foliage was in full glory, the reds, particularly breathtaking for someone who’s been living in California. If you grew up in the area, odds are you visited Mystic Seaport and Aquarium as a child. It’s a quaint reproduction 18th century seaport with lots to see and do. Just down the road is the charming town of Old Mystic, cute shops, great restaurants and the coolest 100-year-old draw bridge. We stay here whenever we visit Mitchell College. 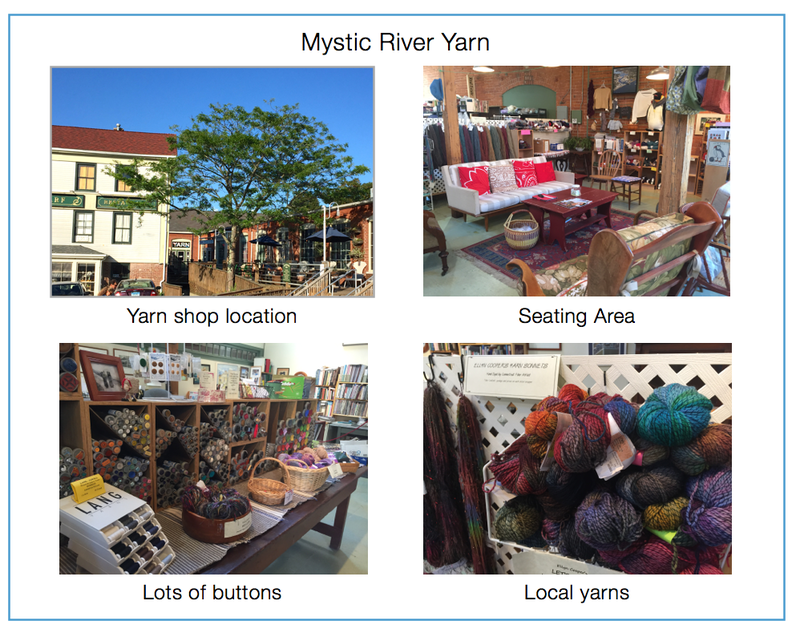 Mystic River Yarns is located on a side street just to the right of the bridge. The street has other cute shops, a nice bakery and pub as well. The shop is warm and cozy and has many of the yarns you would expect. They also had some local yarns which is one of my favorite things to find. The hours are not extensive so plan ahead. They are closed on Mondays and Tuesdays and don’t open until 11 on the other days. Old Saybrook is another popular summer tourist destination. 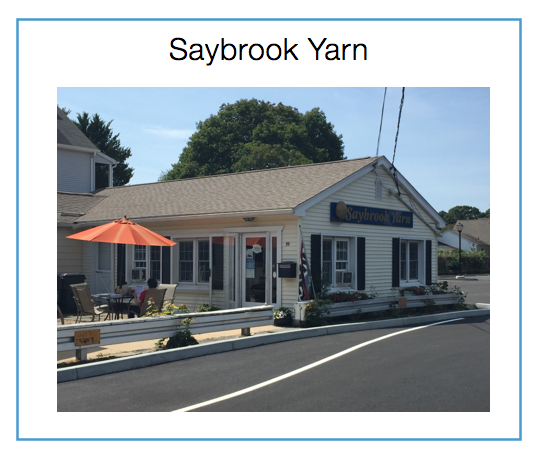 Saybrook Yarn is located in an old house with lots of nooks and crannies to explore. There is even a nice seating area outside for nice days. The staff was friendly and helpful. I apologize that none of my interior photos came out. 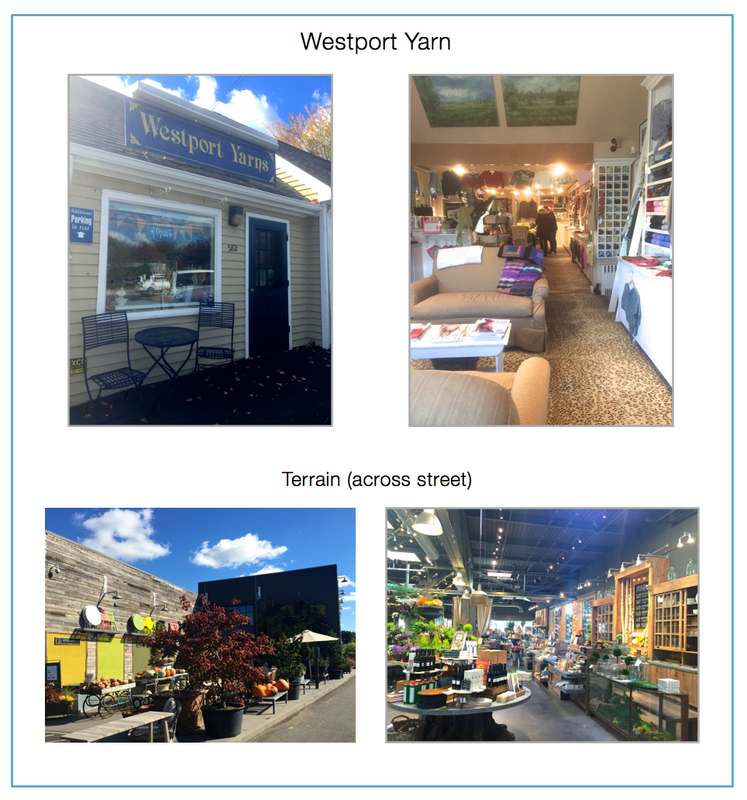 A visit to Westport is the perfect stop on our continuing theme of lovely Connecticut towns. I totally enjoyed my visit to Westport Yarns. It’s just what you want a local yarn shop to be with a nice range of yarns, welcoming seating area, and a friendly staff that clearly loves yarn and chatting about knitting. It’s also right across the street from one of the most beautiful (non-yarn) stores I’ve ever been too, Terrain. It’s a home and garden shop with a lovely cafe, so make an event of it – buy a little yarn and plan what to do with it over lunch. There is perhaps nothing as satisfying as finishing a work in progress and I find that applies to your children as well. I hadn’t realized how I was holding on to that little bit of worry until I saw how fabulously well our son was doing in his new environment. And while we all know a mother’s work is never done, it’s enough for now. 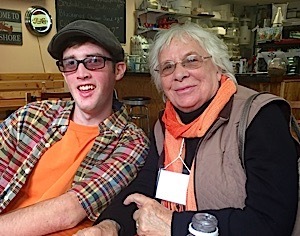 Here are my mother-in-law (a knitter) and son, Graham. Off to the equally beautiful Boulder, Colorado next on the way back to California for another college visit and a few more yarn shops. There’s been a lot of knitting going on my planes rides cross country. I can’t wait to show you what I’ve been doing. This entry was posted on October 30, 2015 by Laura Cunitz in Yarn & Yarn Shops and tagged Connecticut Yarn Shops.